It was a pretty Arizona winter night. The church grounds felt like they went on for acres, probably because they did, and as I waited I tried to distract myself by wondering how much this North Scottsdale real estate is worth. A lot. Finally, after what felt like weeks but was probably 20 minutes, he announced Sophie’s name. 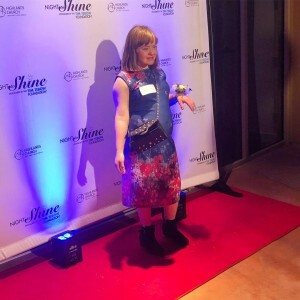 My little agnostic Jew bounded down the carpet, grinning, a fancy corsage hanging from her wrist, and struck several poses for the photographer. Sophie had a blast. She ate garlic bread and sang karaoke. Every party guest got a crown. That is where I live these days, in the spaces in between. In between awful and awesome. It was Sophie’s idea to go to the prom. I didn’t even know who Tim Tebow was, until she found a flyer at a play rehearsal and insisted I sign her up, buy her a dress and new eye makeup. How could I explain to my almost 15-year-old that I hate it when people commit good acts simply in the name of religion, that the term “special needs ministry” makes my skin crawl? That it’s horrible to segregate people with disabilities like this? That after no one wanted to go with her to the Homecoming dance at school she finally had a chance to attend a fancy event but I wouldn’t let her? In other places, I don’t make space. None of this applies to Donald Trump or gun rights or how I feel about grammar. But in this part of my life, the Sophie part, it’s different. It has to be. This isn’t academics, it’s live time. For all of us, life is a series of constant recalibrations, moving targets. Most days, a vicious game of Whack a Mole. You can be 100 percent pro-choice and still want better prenatal education for a woman who finds out she is expecting a baby with Down syndrome. It’s possible to hate the fact that a boy with Treacher Collins syndrome was not cast in the lead for the movie “Wonder” but still love the film and have a good ugly cry, and particularly love the discussions it sparks among your teenage kids and their friends. And among you and your friends. It could be that it was absolutely the right decision to mainstream your kid in school — and that still, every day is impossibly messy in ways that make you want to poke out the eyes of well-meaning teachers, staff and administrators, followed by your own. It’s okay to admire the matching tattoos lots of moms of kids with Down syndrome are getting — and to also have absolutely no desire to get one yourself, not only because tattoos look like they hurt a lot but also because you’ve spent the last 15 years learning what makes your kid unique, not what makes her the same, so if you get a tattoo for her it will be something no one else has. It’s possible for your kid to know every single student at her high school — to get high fives and hugs and lots of love from her classmates every day — and still not have a single true friend. 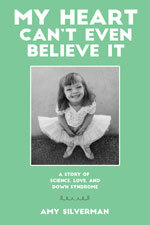 It’s okay to be in awe of the fact that there’s now a Gerber baby with Down syndrome, to think about what that would have meant when your own daughter was born and you felt so alone and like no one out there even knew what Down syndrome was (including you) and to marvel at how far we’ve come, even if it’s not far enough and even if there’s a very strong possibility that Gerber is a crappy company doing this for some of the wrong reasons. It’s possible to hate the school choice movement — particularly because it excludes kids with disabilities and is re-segregating our schools — and still choose to send your typical kid to a charter school because you believe it’s the best place for her. Speaking of that typical kid, you can simultaneously feel that having a sister with special needs is the best thing that could have happened to her, and potentially a burden that will ruin her life. It might well happen that you grow up hating cheerleading and all that it stands for and swear that your daughters will never be cheerleaders — until the day your daughter doesn’t make the cheer squad. You can be a huge champion of the First Amendment and still have the right to ask people to not use the word retarded in front of you. It’s just fine if you don’t like everyone in the disability rights community. Some of them might not like you, either. Just because you both have a kid with Down syndrome doesn’t mean you have anything in common. But some of them might become your favorite people. And it’s okay if you find yourself at church on a Friday night, even though the idea of a special needs prom makes you wildly uncomfortable, because you’re in this for your kid and she begged to go and the world isn’t perfect — and neither are you. And, yep, I get all that. It’s awful, and awesome, to read it, so cleanly written. You nailed it, Amy. This is truly an example of that Taoist parable, “Maybe good, maybe bad”. I have grown as a human being from my experience of raising Lily, but I would give up everything I own for her to not have it. I know that uncomfortable in the name of religion place and it feels just like this. Bam! Nailed it! Thank you for always putting into words just how I feel. Soooooo it was great to be a witness of this grand night out. sighhhhhhh we are in this grand convergence- wanting more but wanting it all to be terribly genuine. Wanting the date to be real not a volunteer who’s willing to be squeezed (exuberantly) for an evening. Still, all the while I’m grateful I had a reason to buy c a brand new coat and he finally had an occasion to wear that really dashing bow tie I bought two years ago. I cheer and wish for more in the same breath. Still and all I must admit I DID truly love every moment of that courageous karaoke !! What about best buddies? They have a big dance in December usually at one of the big hotels in downtown Phoenix for kids from all over the valley, typical and special needs. I know exactly what you mean by lots of hi-fives and not a single friend. we parents are caregivers, “friends”/entertainment and parents. We wear all the hats. I love you. I love Soph. I loved this piece. Once again, Amy speaks truth to life. This is it, all of it. Yup. once again, you’ve nailed it. Thanks! I’m glad she had a good time and I understand completely the turmoil you had at that party! Insightful and beautiful along with really great comments. One of the main topics seems to be creating a contrived scenario and being hurt to watch it play out knowing what it is and isn’t. One cannot deny the good feelings it creates – and that is most important. Joseph Goldstein: “The wonderful paradox about the truth of suffering is that the more we open to it and understand it, the lighter and freer our mind becomes. Our mind becomes more spacious, more open, and happier as we move past our avoidance and denial to see what is true. We become less driven by compulsive desires and addictions, because we see clearly the nature of things as they are.” This piece helps to see this situation and others like it. You have put into words the good and less good and how when they are created in the future what it will mean as the meaning fluctuates back and forth. Thank you again Amy. This post captures so well so many of the mixed feelings I have all the time that I just can’t explain to anyone, even my husband. Thanks. I don’t feel happier, but it is comforting to know that I’m not the only one who experiences this.